The last of this 80s batch is by Ilaiyaraaja, whom I know very little about. I'd like to find out though, because if the two stand-out tracks on 'Sadma' are anything to go by, his stuff is something worth checking out. 'Yeh Hawa Yey Fiza' has a beautiful acoustic guitar and flute intro, followed by wordless vocals one could easily imagine Edda dell’Orso doing had this been an Italian soundtrack, before turning into a great piece of percussion-heavy orchestral funk. 'O Babuaa Yeh Mahua', one of my favourite 80s soundtrack songs, also begins Italian sounding (the harpischord I suppose), has an ingenious staccato yet smooth rhythm, sax solos, and a super cool melody. Magic! If I didn't already have this album, I'd be willing to shell out quite a bit for these two tracks alone. BTW, the alternate spelling of Asha's last name is something I've seen on occasion, especially on movie credits - can anyone explain to me what that's about? Illaiyaraaja is also spelled as Illaya Raja sometimes and most of his scores were for South Indian films rather than Bollywood. Here's hoping the interview link works this time. Hi...your blog entry came up via google alert I had for Ilaiyaraaja. Weird though, the different varieties in spelling, when they can't decide on one within the confines of a single album: 'Yaadon Ki Baaraat' has Baaraat spelt with 2 x aa's on the title/cover, while on the song itself, it's spelt 'Baarat'. Some info in the second thread about a concert he did in Italy ... I don't know much about Illayaraja aside from his name and a couple of soundtracks! I think though that I want to find out more! It's so true, sometimes the cover will spell it one way, the back cover a different way, the media itself a third spelling, lol. Drives me nuts! I think it all comes back to the original language being different, but the inconsistency does create chaos. I have 3 different sources for Ek Baar Mooskura Do aka Ek Baar Muskura Do aka Ek Bar Mooskura Do, lol. Anyways I just wanted to say that this was a good movie. Track 4 basically is one actor telling the other actor (Sridevi) a children's story as she has suffered amnesia and has regressed to a person with the mind of a child. Hello & first of all ! I'm a Bollywood & Kollywood addict from Paris. Great work ! I love your blog. 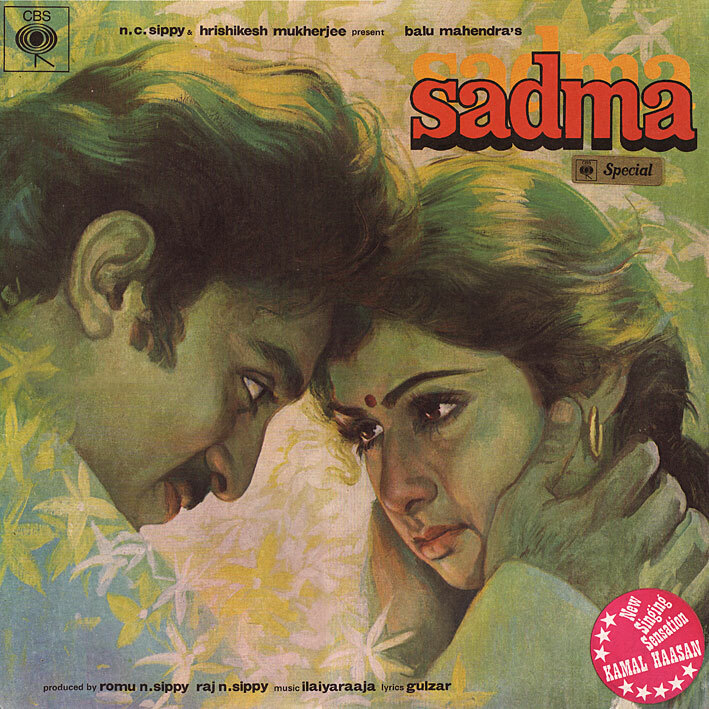 Sadma is the hindi version of the tamil movie "Moodram Pirai" release one year before by the same director Balu Mahendra. So there is 2 version of the same score. And I'm happy to listen to the all soundtrack. Ilayaraja for me is the best composer of Kollywood. The south of India industry in Madras. You have to check the weird soundtrack he create in the 80's. Definitivly a great master. May be this site can help you with you scanning of LP covers its got loads of old Photos hindi LP covers. PC, Please Please Please re-upload this album, I'm dying for this. Can you? Aye Zindagi is a super number and Suresh Wadkar shows his inimitable range and style yet again. Wanna know something funny? The BMI dbase lists that "Aye Zindagi" was written by Gulzar and... RD Burman! Now I understand this could be a wholly different song from a wholly different film, but for the unguided initiate, this would almost lead you to the conclusion that Ilaiyaraaja is a pseudonym for Burman. It's a darn good thing that more informed heads have rung in about this composer! Ilaiyaraaja is great. The first soundtrack of his that I knew about was Thalapathi, which I found about a year ago by tracing a sample from it that M.I.A. used for her song "Bamboo Banga." (Yes, I'm kind of new at this stuff, but also obsessive - so, caught up for lots of lost time!) Once I heard that soundtrack, I checked out every Ilaiyaraaja song I could find on YouTube (of which there have been many) and beyond. But I don't know if I could say without reservation that he is the best composer of Kollywood - not the best ever, because I really like some of those old soundtracks by G. Ramanathan. whyilya raja did ot call kishore for a zinagind surmai the topmost singer? the renitions would hve ben ore ht and ilya would have been hit! Illiayaraja is most definitely a genius. I love him. I have a goodly handful of Telugu / Tamil language cassette "2-fers" that are amazing in their melodies, arrangements, and quirkiness. Look for "Challenge" from 1984, every song is fantastic. Ilaiyaraaja is India's best kept secret, when it comes to music. He can amalgamate western classical with indian classical and pepper it with jazz and blues! His inspirations are many, from Bach to Saint Thyagaraja (of Indian classical). He composes, writes the entire score and conducts the score himself. For goose bumps: Listen to "Nothing But Wind" and "How To Name It" - two monumental instrumental albums by him. He is immensely talented. A genius! There are hundreds of film scores that I can recommend.But dont miss the above instrumental albums. Duly noted; I'll keep an eye out for them. Thanks for the tip.